Bring Me The Cheesy Head Of Steve Jobs! There are Apple fans and there are Apple fans. For instance, when an Apple fanatic and food blogger Ken at The Cooks’ Den wanted to pay tribute to Macintosh’s head cheese he did what came natural. 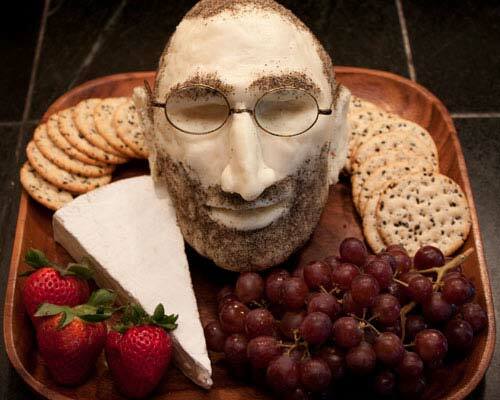 He put his foodie skills to good use and made a bust of Steve Jobs out of cheese! He used mozzarella (rather than breast milk cheese), a mild and soft cheese, with pepper for the beard and scalp stubble, and even accompanied Steve with an old pair of eyeglasses. It’s the perfect food for the buffet at a cannibal-themed party. You’ve got a millionaire’s cheesy head, some gruesome bread heads, and a few chocolate skulls. Top the Steve head with a stylish nacho hat for an extra kick of spicy, south of the border flavor. For extra authenticity, mold the cheese around the chocolate skull, and fill with pudding brains!